Albert Bierstadt (1830-1902), Near Salt Lake City Utah, c.1881, oil on paper on board, 13 7/8 x 18 7/8 inches. Brigham Young University Museum of Art, 1965. Like many 19th-century landscape painters, Albert Bierstadt was lured to the West by reports of its majestic mountains and valleys. He first visited Utah territory in 1863 and returned twice. 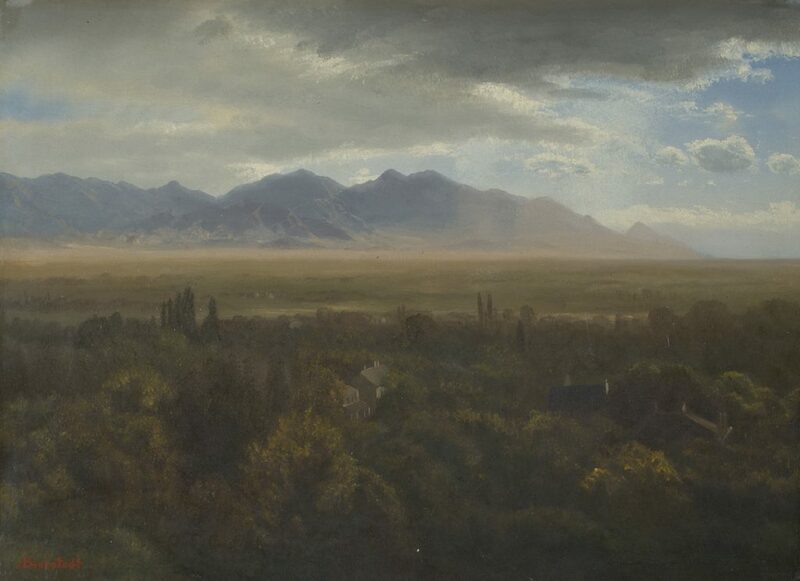 Bierstadt painted this atmospheric view of Salt Lake Valley looking west toward the Oquirrh Mountains. The abundance of mature trees evident in this work was not yet in existence in the arid Salt Lake Valley of the 1860s, suggesting it was painted on a later trip in 1881.